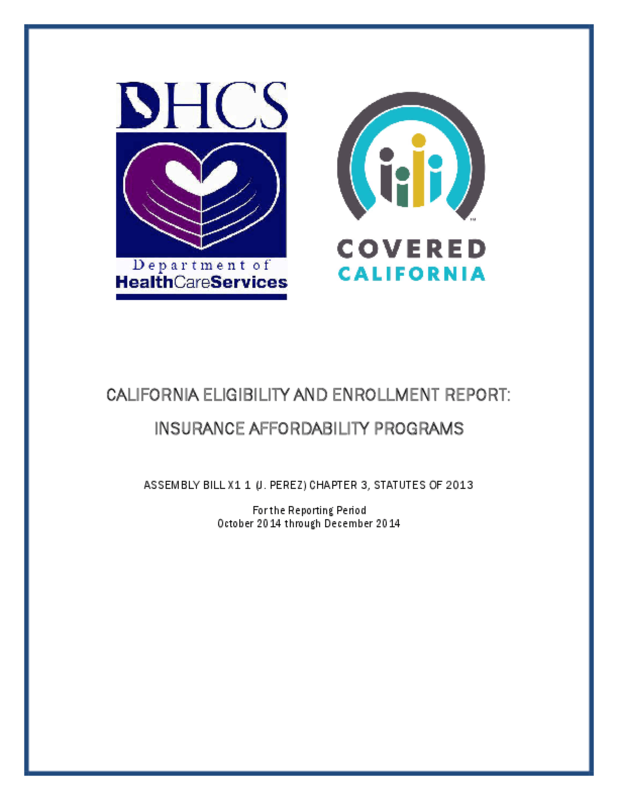 With the launch of Covered California in 2013 and the expansion of Medicaid in 2014, Californians have access to a range of affordable health insurance choices. This report responds to California Assembly Bill x1 1 (J. Perez) Chapter 3, Statutes of 2013, Welfare and Institutions (W&I) Code Section 14102.5, which requires quarterly reporting on eligibility and enrollment processes for all California insurance affordability programs, including Medi-Cal, the Medi-Cal Access Program, and Qualified Health Plans (QHPs) available through Covered California. This report presents application, eligibility, and enrollment data covering the period from October 1, 2014 through December 31, 2014. The report focuses on the initial steps and outcomes of the enrollment process for new applicants during this reporting period, including the venues through which applications were received, consumer assistance in filing applications, applicant demographics, resulting eligibility determinations, enrollee demographics, plan enrollment choices, and the volume and outcome of eligibility appeals. Future quarterly reports will incorporate additional measures -- such as trends in disenrollment among current enrollees -- as data become available. Copyright 2015 California Department of Health Care Services (DHCS), Covered California.